This Halloween, Discover’s price protection benefit will make like a ghost and disappear. Discover confirmed that it would discontinue the price protection benefits on its cards on Oct. 31, 2018. The issuer eliminated several other ancillary benefits earlier this year — including extended warranty, purchase protection, return guarantee, auto rental coverage and flight accident insurance. “As common practice, we regularly evaluate our cardmember benefits to ensure that we are meeting or exceeding our cardmembers’ current needs and expectations,” the issuer said in a statement about the change. Price protection allows cardholders to get refunded for the difference when an item they’ve bought drops in price within a certain time period. Discover’s current policy promises to refund the difference on eligible items that drop in price within 90 days of purchase, for up to $500 per item and $2,500 each year. 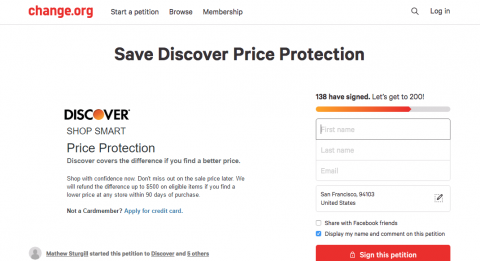 Mat Sturgill created a Change.org petition protesting Discover’s decision to remove price protection. Unlike similar policies offered on other credit cards, Discover’s price protection didn’t exclude limited-quantity items. That made it a handy way to save money in advance of major sales events, such as Black Friday. “That was the primary draw to Discover for me — their price protection program,” says Mat Sturgill, who created a Change.org petition protesting Discover’s decision to remove price protection. As of this writing, the petition had 138 signatures, with a goal of 200 signatures. Sturgill, an IT professional in Forest Lake, Minnesota, says he has used Discover’s price protection often. Once, when Best Buy offered a Black Friday doorbuster promotion on a big-screen TV for $399, Sturgill bought the same model at Target before the sale for $699. By using his card’s price protection benefit, he later filed a claim to get $300 back — effectively taking advantage of the Black Friday sale while avoiding the frenzy. “My initial thought was, ‘What … could I do to send a signal that this was going to impact a lot of different people who utilize this benefit?’” Sturgill says, explaining why he started the petition. Discover declined to comment on Sturgill’s petition. This isn’t the first time a price protection benefit has vanished this year: Chase, citing low usage, eliminated price protections on several of its cards and Citi also reduced price protection coverage.